Lua error in Module:Location_map at line 488: Unable to find the specified location map definition: "Module:Location map/data/New York" does not exist. The United States Military Academy at West Point (also known as West Point, USMA, Army (athletic teams)) is a university that teaches students to become officers in the US Army. Students are called "cadets" and are subject to military rules while studying subjects like engineering and military science for four years. For many years, West Point only taught men, but in 1976 West Point admitted its first female cadets. Women currently comprise approximately 15% of entering new cadets. Military officers compose 75% of the faculty. Civilian professors make up the remaining 25% of faculty positions. 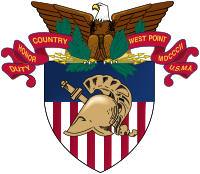 Congress formally authorized and funded West Point on 16 March 1802. West Point was so successful, that military academies were added later for the Navy, Coast Guard and Air Force. West Point was originally a Fort. The Continental Army used it to guard the Hudson River. General Benedict Arnold tried to betray it. West Point has a very broad sports program. All of its students are required to compete in at least one sport, either at the intramural (i.e., within the school) or intercollegiate (i.e., against other schools) level, in every semester. The Army intercollegiate sports teams are nicknamed "Black Knights". Most Army teams play in the Patriot League. The football team plays at the highest level, known as Division I FBS, but is independent—not in any conference. The men's ice hockey team plays in Atlantic Hockey. ↑ 1.0 1.1 Ambrose (1966), p. 22. ↑ "USMA Commandant's Corner". United States Military. July 2014. Retrieved 4 November 2014. ↑ "Army Now Down to 496,079". Army Times. 6 May 2015. Retrieved 11 May 2015. ↑ United States Military Academy Style Guide (PDF). 2014-10-02. Retrieved 2017-04-05. ↑ "The Class of 1980". Smithsonian National Museum of American History. Retrieved 30 December 2008. ↑ Barkalow (1990), p. 20. ↑ "Class of 2012 enter West Point". West Point AOG. Retrieved 30 December 2008. ↑ "Fact Sheet: USMA Faculty". USMA Public Affairs Office. Retrieved 21 January 2009. Barkalow, Carol (1990). In the Men's House. New York: Poseidon Press. ISBN 0-671-67312-2. Endler, James (1998). Other Leaders, Other Heros. Westport, CT: Praeger Publishers. ISBN 0-275-96369-1. Lipsky, David (2003). Absolutely American: Four Years at West Point. Boston: Houghton Mifflin Company. ISBN 0-618-09542-x Check |isbn= value: invalid character (help). West Point: Legend on the Hudson. Poughkeepsie Journal. Montgomery, NY: Walden Printing. 2003. ISBN 0-9674209-1-1. This page was last changed on 12 March 2019, at 06:18.